Let's display the star-spangled banner around our home and bake up some treats for the Fourth of July decorated in red, white, and blue. 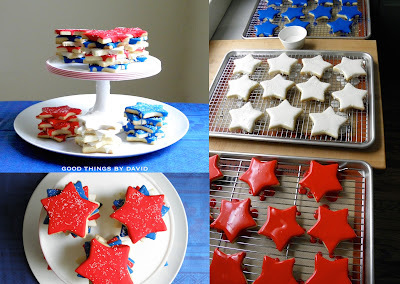 If you're heading out to a parade, attending a celebratory gathering or are hosting a delicious barbecue, I encourage you to make iced sugar cookies with images of the American flag. Let's celebrate! 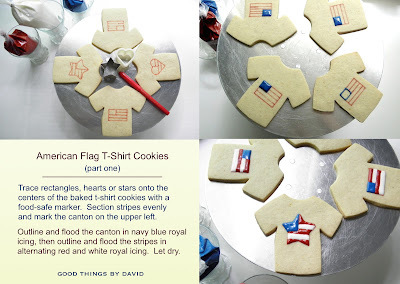 This year I decided to make some t-shirt cookies with American flags to surprise some guests at a four-family gathering. Rather than just having rectangular images of old glory, I wanted to include stars and hearts for variety and visual interest. What I had in mind was a plain white t-shirt, with a bold image right in the middle. True to my style of decorating cookies, I kept the images simple, yet thoroughly prominent. There is nothing whatsoever difficult about these American Flag T-Shirt Cookies, and what's nice about them is that they can be made any time of year. You don't have to wait for the Fourth of July to be patriotic. Make some this week for your festivities and place them out for everyone to enjoy. This versatile T-Shirt cookie cutter was a recent addition to my collection. What I love about the shape and size of the cookie cutter is that it has plenty room to get creative. 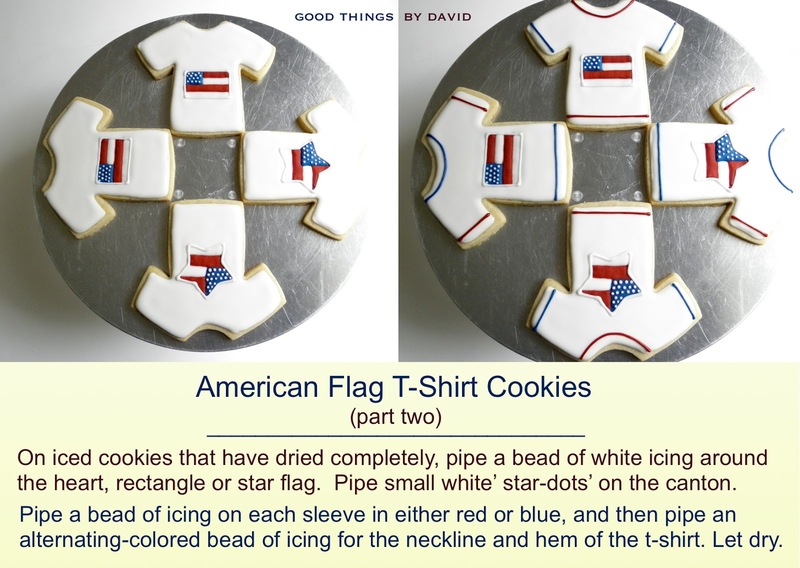 I can see this being used for birthday parties, school picnics, college treat packages, sporting events, company logos, etc, but it's just the thing to make American flag t-shirt cookies. It's up to you what cookie dough flavor you make, but do make sure that it's delicious and good to work with. You want the cutouts to hold their shape. There are only three colors you're working with here, white being the easiest. In order to get a true 'navy blue' royal icing, you need to tint a small batch with 'royal blue' until it's quite vivid and deeply saturated, and then you add one drop or two of black gel paste food coloring. The 'flag red' is also treated the same. Tint a small batch of royal icing with 'red red' gel paste making sure it is bright cherry red, then add one or two drops of black gel paste. Mix the colors together well and let the red and blue sit at least 30 minutes so that they have a chance to deepen even more. If it's the color you desire, proceed with filling your pastry bags or squeeze bottles. Although the flag centers of the t-shirts are quite simple, they still require a bit of thought. Using a food-safe marker, trace a heart, star, and rectangle shape with small cookie cutters, making sure each shape is centered. Divide the canton and stripes evenly within the shapes. Using a good, flooding consistency royal icing and #1 piping tips (or #1.5 if you have them), outline and flood the canton in navy blue, and then outline and flood the red and white stripes. Do this step first on every single cookie you'll be decorating. I let the flag shapes dry. The easiest step is using flooding consistency royal icing to outline the t-shirts (leave about 1/4" of space from the edge just in case the icing wants to shift a little) and then quickly flood the entire cookie in the white icing. This is best done with a #3 plain piping tip. The final touches are also very easy. Pipe a plain white border on each star, rectangle and heart using a #2 piping tip. Pipe small white 'dot stars' on each canton. With #2 piping tips, pipe either a red or blue hem and neckline, then pipe the other color for the sleeves. Let dry. Once the cookies are dry you can place them on platters or if you want to hand these out as party favors, slip them into clear cellophane bags. I found these American flag stickers at a craft store and thought to seal each bag with one. Fold the opening of the bag behind the cookie and seal with a sticker. Easy! As I was telling my dear friend when I delivered these cookies, there won't be one left at the end of the barbecue because everyone is going to want one. Have fun making these patriotic treats! 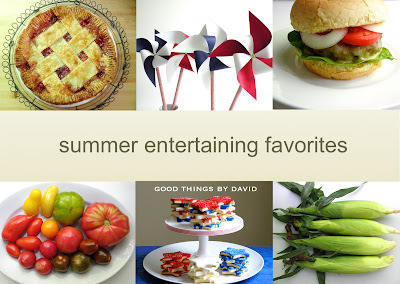 Summer is a great time to entertain. Everyone likes to have company over at least once or twice during the season, so that one can share good food, lots of laughs and the best of the best. I'm all for going to the farmers market every single week to pick up the most colorful, juiciest and flavorful fruits & vegetables for us to feast on here at home, but if I happen to be harvesting summer berries or other fruits from the property, even better. 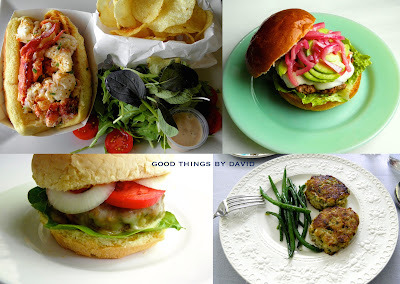 Should I have company over for an afternoon luncheon or dinner, then I make an extra effort to bake a pie or a cake and pick the most flavorful meat for burgers or perhaps some Maryland blue crab for savory crab cakes, if I'm in the mood for them (this is most often the case during summertime). After I choose a main course and at least one dessert, then everything else falls into place. The dinnerware, flatware and glassware can be dressed up or down depending on the ambience I want to create. 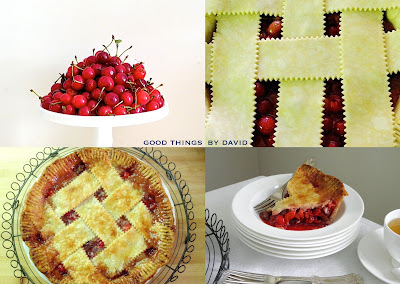 Here are a few of my all-time favorite summer foods, drinks and desserts that I've been fortunate enough to have shared in the past. When I look at each and every one of these food items, I almost feel as if summer wouldn't be the same without them. Pick and choose what suits your tastes. If you happen to be hosting a Fourth of July barbecue, a special birthday party or if you simply want to enjoy the company of friends and family this summer, any one of these recipes will see you through a pleasurable gathering. Make sure to click on the highlighted links for recipes! 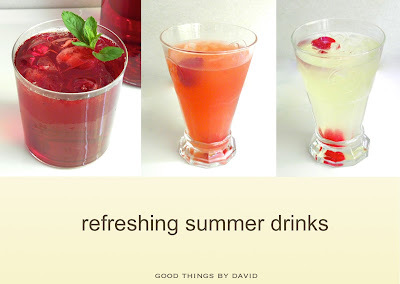 Every get together should have something refreshing for all guests to sip. A simple lemonade, pink lemonade or an iced tea will undoubtedly quench the biggest of thirsts. Of the utmost importance is to make them with fresh, quality ingredients. Pick up a basketful of lemons, some fruity teas and some raspberries. The crimson-colored hibiscus iced tea is wonderfully easy to make, because it requires a small amount of ingredients. I like to keep a jar of dried hibiscus flowers in my pantry so that I can make carafes of this tasty tea. For the perfect lemonade, do use freshly squeezed lemons and a simple syrup to sweeten the drinks. Whether or not you choose to drop some raspberries, strawberries or even blackberries, make sure you have plenty of this for your gathering. While I don't have recipes for burgers, crab cakes or lobster rolls, I find these to be quintessential summer food for me. Every region of this country of ours has their tried and true barbecue favorites, and I'm all for cooking what's fresh and what's available in your area. Burgers can be customized with any sort of fix ins. I love cheeseburgers served with sliced tomatoes, sweet onions and lettuce. The buns have to have a mix of mayo and ketchup (don't judge!). However, I also love to add pickled onions and sliced avocado if I have any. If you happen to reside on the east coast and have access to the tastiest Maryland blue crab or lobsters, try some crab cakes or lobster rolls. A good lobster roll, to my mind, must have a buttered potato bun, and be filled with a combination of tail and claw meat. It should not be drenched or covered in lots of mayonnaise, because it's the sweetness of the lobster you want to taste. Crab cakes should not have too much binder or filling either. A combination of jumbo lump and lump crabmeat makes flavorful cakes which can be served as appetizers or as a main course. 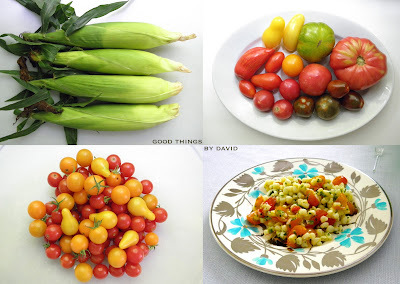 Can you imagine a summer without fresh corn or plump tomatoes? I can't. For me, the moment I spot sweet white corn from the Amish in Lancaster County, Pennsylvania, I buy them by the dozen. From nibbling them fresh off the cob with lots of sweet butter and sprinkled with coarse salt, to sautéing the kernels in olive oil or having them tossed into salads, corn is an American staple. Tomatoes have to be garden picked or straight from the farmers market. Eaten in sandwiches, salads, burgers or as is, get local, pesticide-free tomatoes and savor them all summer long. Remember this: never refrigerate tomatoes and use them as soon as possible. An asset to any cook is the perfect vinaigrette, because it can be used in any type of salad, and it can serve as a marinade for a variety of meats. 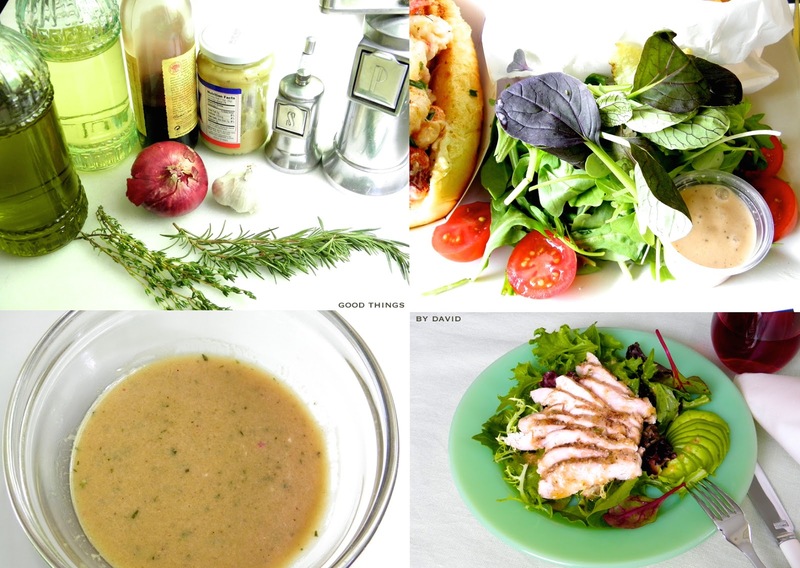 Make this vinaigrette once, bookmark the page and return to it again and again. It's good! 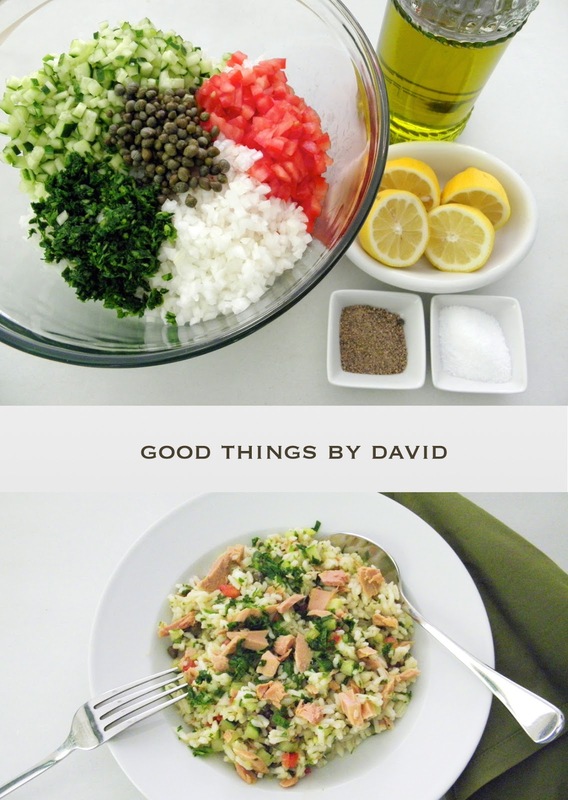 Rice salads are surprisingly refreshing, because served cold, these types of salads can be eaten as a side dish or can be enjoyed as a main course. I've been making my rice salad for over a decade and it's always a hit with people. For those who are eating gluten-free diets, this is a nice alternative to regular lettuce-based salads. Flaked salmon or tuna is completely optional. It's a wise thing to have at least one or two vegetarian dishes at your gatherings for those who prefer them, and with a little planning, these can also be vegan. If you like black beans, make a large pot of them the day before your get together and simply reheat when everyone arrives. Quinoa is a nice , protein-rich side to have with just about anything. A serving of black beans, quinoa and perhaps some summer corn, topped with a fresh salsa will have anyone asking for seconds. 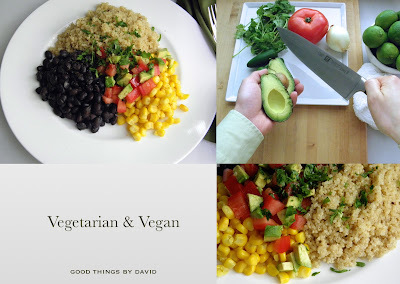 Vegetarian and vegan doesn't have to be plain or boring. Spice it up! 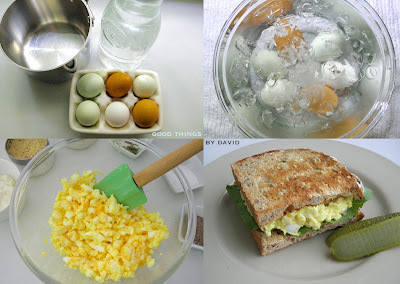 I know some people can't abide by egg salads, but I love egg salad. My egg salad recipe is a good one because it isn't runny or full of mayonnaise. With a handful of ingredients, this egg salad can be used for sandwiches or as a topping for any lettuce-based salad. Fresh farm eggs are key. Perfect hard boiled eggs can be made a day or two ahead of time, but do make sure they're cooked the right way. Nothing is worse than an overcooked, rubbery egg. Click on the link for a how-to with a timing guide. My favorite part of entertaining is getting to the dessert. Cherry Pie is the all-American dessert that I crave every single summer. I scour the farmers markets for the best Montmorency cherries. The sour cherries are bought in bulk and are then pitted and frozen, so that I can enjoy them throughout the summer. These cherries are only available for about two weeks, so it's best to hoard them when they're available. 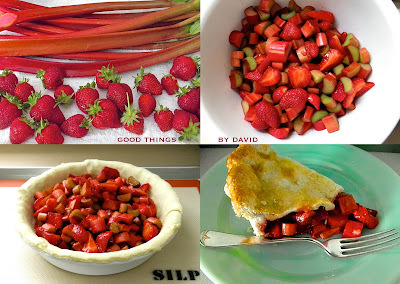 Serve great big wedges of this pie with a scoop of vanilla ice cream for your Independence Day celebration. 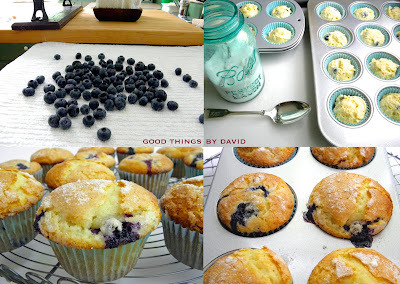 This recipe for Blueberry Muffins is the best one I've ever tasted. It was given to me by my friend, Teresa, a couple of years ago and it has since become my family's favorite blueberry muffin. Made with basic, wholesome ingredients, the muffins can be served with your boiled lobster dinners, fried or barbecued chicken, or any summer main course. These are superb! If you want to go low-cal and super healthy, make a patriotic-colored serving of yogurt with chopped strawberries, blueberries and maybe some granola. This is a tasty dessert that anyone can construct on their own. 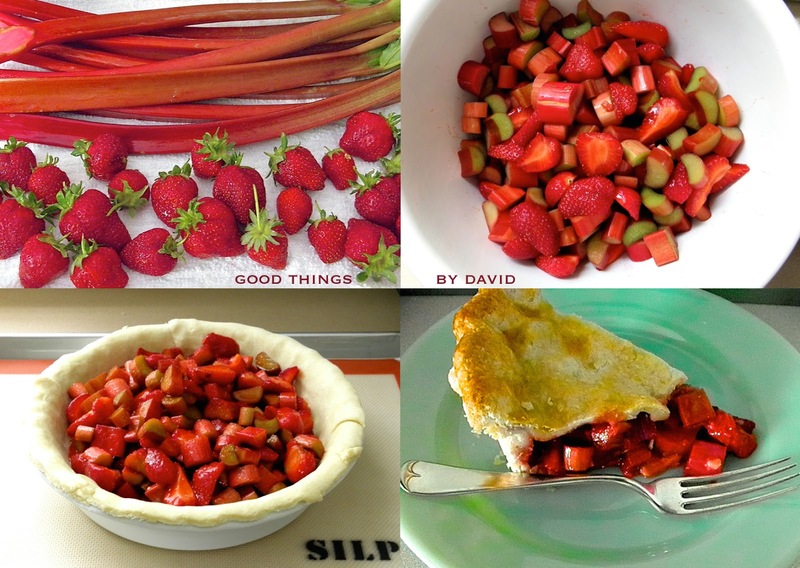 Strawberry Rhubarb Pie is made every single year at my house, because the combination is super tasty! There is so much goodness in each of these pies. Aren't you tempted? Don't forget that in order to make a flavorful pie, other than having top quality ingredients for the filling, is to make the Best Pie Crust. Click on the link for my recipe. I use eggs and vinegar in my crust! As I write this entry, the raspberry brambles are ready to burst with a plethora of tiny berries. 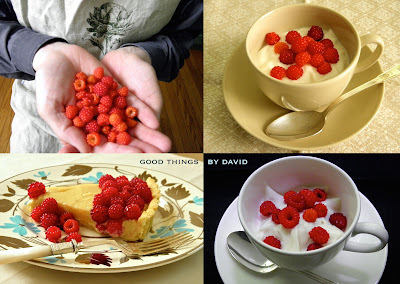 I like to eat them as is, but I also like to have a few scattered over yogurt or as a garnish for summer tarts. 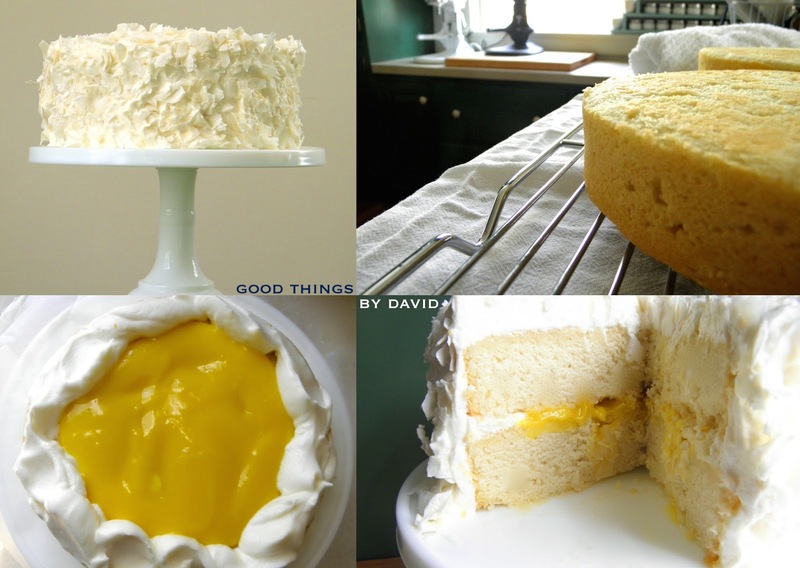 Coconut Cake is the perfect cake to serve for summer gatherings. Downy coconut cake layers sandwiched with orange curd or lemon curd, get covered in an old-fashioned boiled icing. The large flakes of coconut make each bite even better. This type of cake is best kept cool before serving, because of the icing. I don't recommend having this dessert sitting out in hot weather. 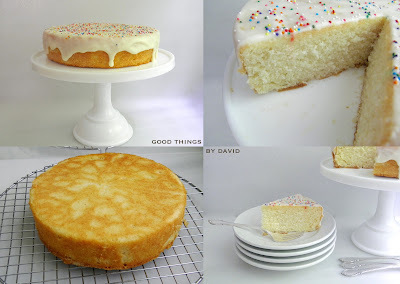 However, if you want a stress-free cake to serve as a single layer, I suggest making easy Vanilla Cake Layers. These can either be dusted with confectioners sugar or drizzled with a delicious vanilla glaze. If you want to make them even more enticing, shower each layer with colorful sprinkles. Don't forget some ice cream! Cupcakes will never go out of style. For any summer party, red velvet, chocolate or even coconut cupcakes can be topped any number of ways. These are ideal for anyone wanting something sweet and small, as opposed to a large slice of cake. Kids of all ages love them! 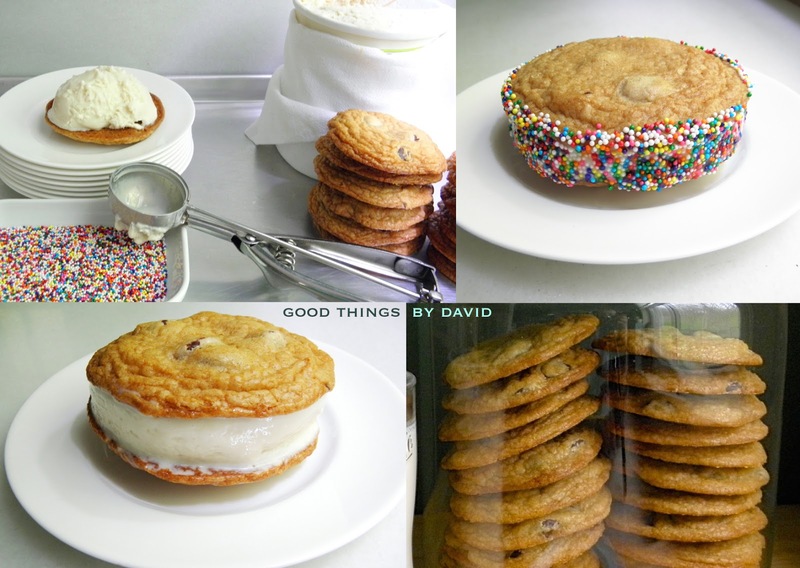 I can't mention summer entertaining favorites without a shout out to the chipwich. Homemade chocolate chip cookies are essential if you want your chipwiches to be hits at your party. Assemble these the day ahead and keep them in the freezer until it's time to serve them. Have sprinkles, jimmies and other 'enhancements' nearby. These are best left until serving time. You don't have to be a kid to enjoy one of these childhood favorites. Make lots. By now you must know that I love a good sugar cookie covered in icing. Patriotic Star Cookies can be made all summer long, but they are perfect for the Fourth of July. What I like about these little treats is that they are simply dipped in icing and are left as is. Stacked on pretty cake stands in alternate colors, the red, white and blue cookies are so fun and festive. 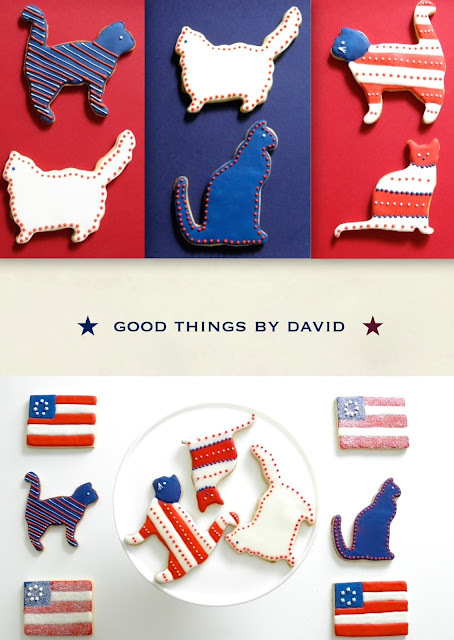 How about some patriotic kitty cats or some flag cookies? If you keep the decorations and designs simple, these too can be made with a minimum of fuss. Go through that post and get an idea or two for party favors. I guarantee everyone will want to take one of these cookies home. I hope all of you are having a wonderful summer. There is so much to enjoy right now, so much to look forward to and so much to be grateful for. Entertain friends and family at least once this season and make your gathering fun, festive and memorable. 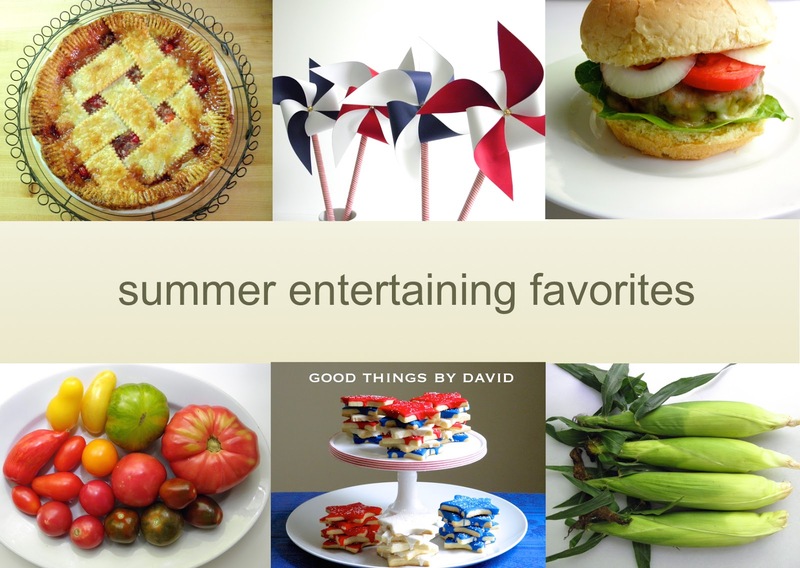 With a few key ingredients, some imagination and the best of the very best, have fun entertaining this summer! Every now and then it's a good idea to surprise a dear friend or relative with a gift made from the heart. A week ago I wanted to do just that to a very good friend of mine by baking and decorating some garden-inspired cookies to send their way. With a few cookie cutters that I recently added to my collection, I cut out chocolate cookies in the shapes of a watering can, garden flowers, ladybugs and a garden shed. I only used three colors of royal icing for them and a handful of decorative elements to embellish. Wrapped in clear cellophane bags and tied with grosgrain ribbons, the cookies were packaged in pairs in order to provide extra support and minimize breaking during shipping. It's one of my little tricks that has worked for all of my cookie shipments. In the near future, I will give a more in-depth tutorial on how to safely ship decorated cookies. If you've been following my cookie decorating posts these past few years, you know that I like to work near my sunny window at the dough counter of the kitchen. As you can see, I had a small set up of baked cookies (chocolate cookies made with the darkest Valrhona cocoa), royal icing-filled piping bags (white, light teal, and mint), sanding sugars (clear & teal) and some silver dragées. Last, but not least, is the rotating cake turntable for decorating. The watering can cookies were placed with a piece of card stock in between so that the spout would not break off. A monogrammed watering can iced in mint, teal and white royal icing doesn't need much to be deliciously pleasing. This closeup of the green flower cookies shows the deep, dark color that Valrhona cocoa powder yields in a baked good. Not only does it provide a very nice canvas for decorating cookies, but it gives each treat that extra layer of flavor that is so delicious. Each flower was flooded in mint-colored royal icing and was then given dotted petals and plain white borders. A single silver dragée was placed in the middle. I loved these garden shed cookies. Believe it or not, each cookie was cut out with an oversized cupcake cookie cutter, which had the swoops of icing removed with a sharp knife to create the steep-angled roof; instant garden shed or mini house! The roofs were iced in plain white and the walls were given mint-colored royal icing. The door was iced in teal and then latticed eaves, windows and small flower pots (with candied flowers) were added on the facades in a contrasting color; add a silver dragée door handle to make it a luxe shed. Take a closer look. That garden gnome was part of an assortment of decorative sugar elements which were given to me by my good friend Janet. I knew immediately that the gnomes would be used for these cookies. Thank you, Janet! Garden Cookies are bound to charm anyone who is celebrating a birthday, throwing a garden party or perhaps needing a bit of cheering up. It's good to let the loved ones in your life know how much they're appreciated and cared about. 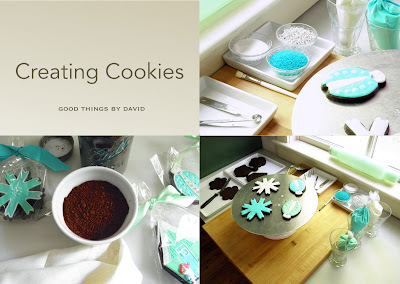 If they happen to enjoy a cookie or two with their tea or coffee, give them some custom-made cookies in their favorite colors. 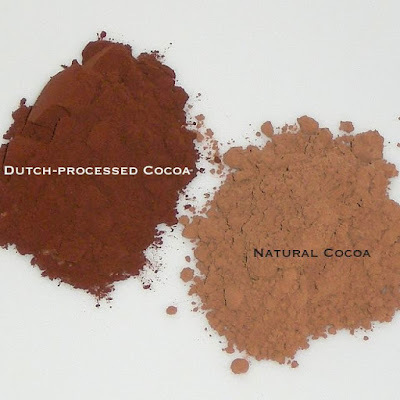 What is Dutch-process cocoa powder? A reader recently asked me: what is Dutch-process cocoa and where can one find it? To put it simply, it is cocoa powder that has been treated to make it alkaline, and it can be bought in most supermarkets or gourmet food stores, and, of course, online. I have a penchant for using Dutch-process cocoa in my desserts because I love its flavor and color. The beverage in this photo is the last word on hot chocolate. Click here for that recipe. Cocoa powder is the cocoa solid end product when cocoa butter is removed from the cacao beans; cocoa butter or cocoa fat is what's used to make bar chocolate. In its unadulterated state, cocoa powder is light in color (photo above), naturally acidic, and is high in flavonols. Natural cocoa powder is the most common type found in supermarkets and is not expensive whatsoever (think Hershey's). 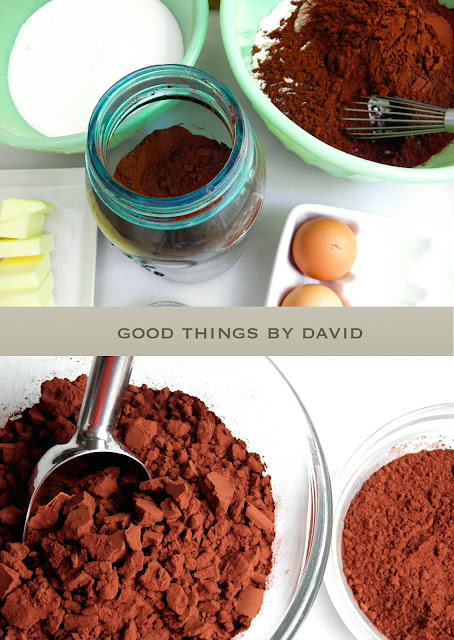 Baking recipes for cakes and cookies which use 'unsweetened cocoa' or 'natural cocoa' generally call for baking soda instead of baking powder as part of the leavening agent. The chemical reaction between the baking soda and the acidic natural cocoa produces carbon dioxide, which does three things to the baked good: it leavens the batter, it neutralizes the acidity and darkens the color of the cocoa. Dutch-process cocoa is slightly different. Dutch-process cocoa powder has been treated with an alkalizing agent, usually potassium carbonate, which renders its pH to neutral. 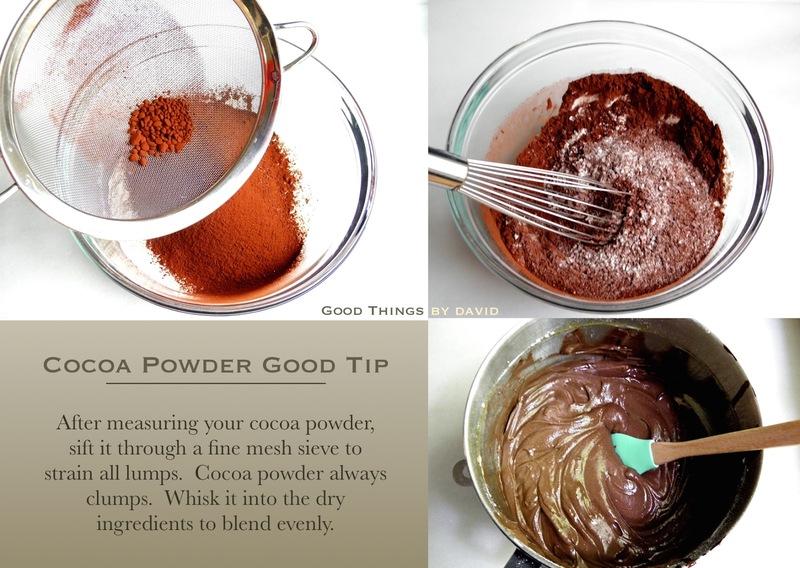 This cocoa powder is much darker in color, pleasing to the palate and does not work in conjunction with baking soda in baked goods. Because 'dutched' cocoa does not react with baking soda, recipes for cakes and cookies using Dutch-process cocoa commonly have baking powder as the leavening agent. 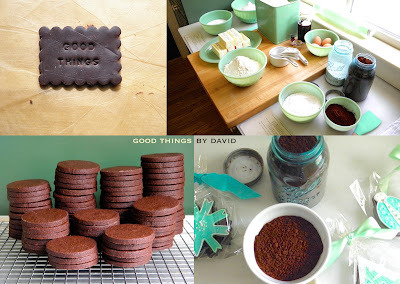 It is possible, of course, to have cookies made with Dutch-process cocoa without any leavening agents. My Chocolate Cookies and Heirloom Chocolate Cookies are such examples. It is used in many desserts by professionals and is becoming more common among home bakers as well. Found in most gourmet food stores and even in regular supermarkets, brands that are reliable include Droste, Callebaut, Guittard, Rademaker and, of course, Valrhona. I've used all of these brands and have been pleased with the results over the years, but if I'm going to be truly honest, I tend to stick with one. If you have some cocoa in the cupboard and are not sure if it's Dutch-processed, mix some in a bowl with warm water, and sprinkle a pinch or two of baking soda into it. If it bubbles, then it is natural cocoa, but if it does not react, then it is Dutch-process. Labeling on Dutch-process cocoa packaging will tell you if it has been alkalized. Valrhona Cocoa powder will always give me consistent results in the kitchen and it is the cocoa powder of choice for me. I keep it in stock at all times, because I love how it blends into desserts and I can't get enough of its flavor. 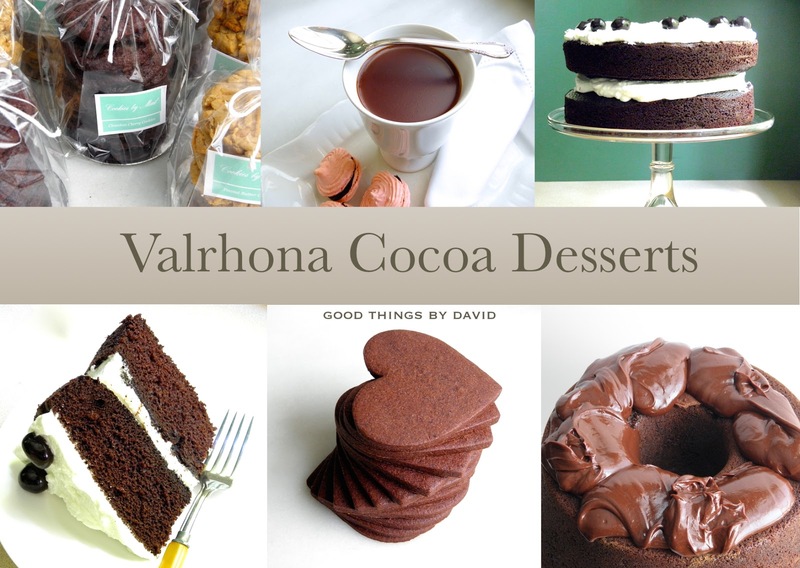 Whether it is hot cocoa, cookies, cakes, frostings or puddings, I always reach for my Valrhona cocoa in the Pantry. I buy mine at Whole Foods since it is near my home, but online sources abound for this particular cocoa powder. If you can, give it a try and see for yourself. There is one thing that I strongly advise for any baker using cocoa powder to do when preparing their desserts. Sift! Cocoa powder naturally clumps and must be sifted. When working with a recipe, I measure out the cocoa straight from the jar and place it in a sieve set over a mixing bowl. I give this a good shake until everything goes through. Anything that clumps gets pushed through with a silicone spatula. I then use a whisk to thoroughly blend in the cocoa with the other dry ingredients. Done and done! If you've never used Dutch-process cocoa powder, I encourage you to try it. If you want to make the most patriotic cookies this season, reach for the collectible cookie cutters from Martha by Mail shaped like a flag and shield. 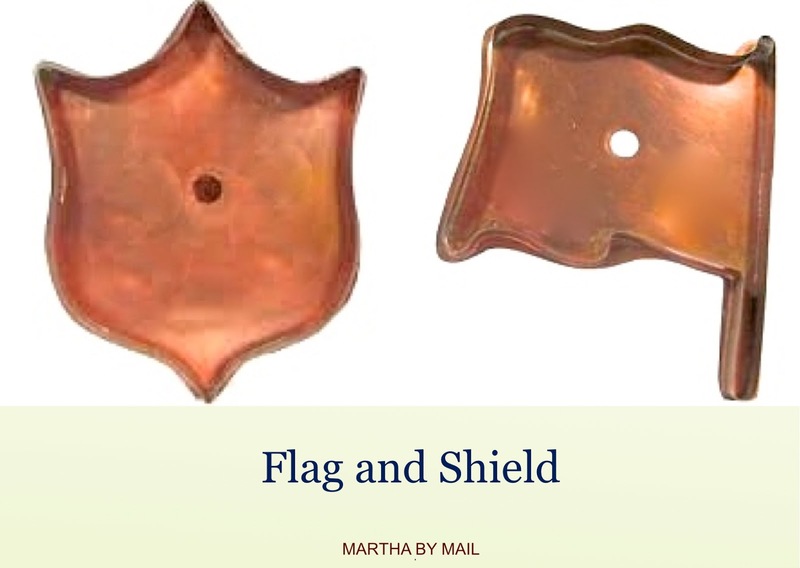 The giant closed-back cookie cutters made of copper were offered for a very short period of time through Martha by Mail. This set was the nineteenth design for the large, closed-back cutters from American coppersmith, Michael Bonne, through Martha by Mail. They have since become classic Americana and are highly sought after by bakers and collectors. 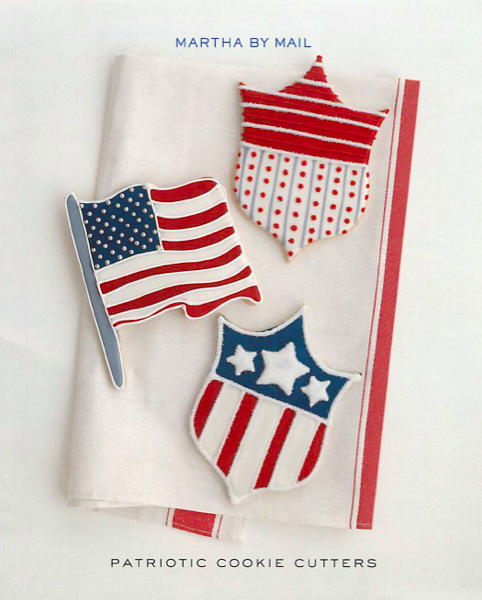 Use the iconic cookie cutters to create American flags and shields this season to give as gifts for Independence Day. Everyone is going to want one! Use royal icing to decorate your patriotic cookies to look like the ones on the front of this card. You will also need gel food coloring in red and blue, a pastry bag fitted with a small round tip, an offset spatula or toothpick, dragées and tweezers (optional), and sanding sugar. Consistency may be thinned by adding water. 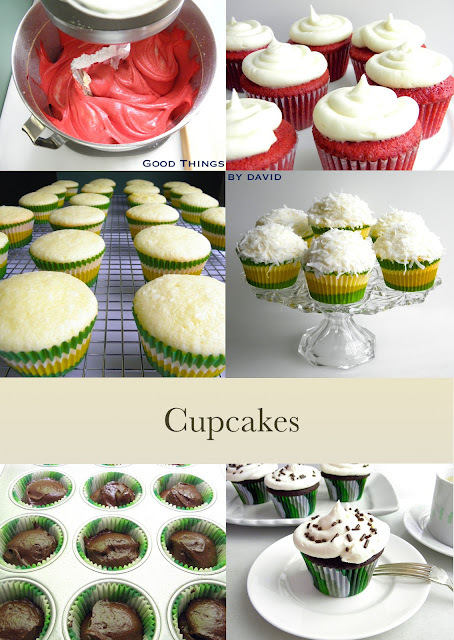 To tint the icing, add two or three drops of gel food coloring after mixture is smooth. Store, covered, at room temperature for up to 2 weeks. Place meringue powder and a scant 1/2 cup water in bowl of electric mixer fitted with paddle attachment. Whisk mixture on low until combined. Add sugar, scraping sides of bowl as needed; beat until soft peaks form and mixture is smooth, 10 minutes. Flooding: Provide a smooth icing base for decorating Using pastry bag and tip, pipe outline of icing around area of cookie to be filled. Let set. Draw icing zigzags within outline, and spread to an even layer with offset spatula or toothpick. Piping: Using pastry bag and tip, pipe a design onto a plain cookie or one that has been flooded. For raised piping, the icing underneath must be dry; for a smooth, flat design, pipe on top of wet icing. Flocking: To add sparkle, draw designs in icing, then sprinkle with sanding sugar. Let stand 1 hour; tap off excess sugar. Or use tweezers to set dragées on wet icing. If you feel like making even more designs, use the Martha by Mail Moon and Star Cookie Cutters to add that extra sparkle and color to your Fourth of July celebration. Simple flooded bases get outlines and flourishes in our flag's red, white and blue. Here is a nice dessert table set up from Martha by Mail using the collectible L.E. Smith Glass cake stands. The cupcakes add a nice touch with their colorful sprinkles and flag toppers, and the cookies look extra tempting wrapped in clear cellophane. If you're lucky enough to own this beautiful set of cookie cutters, let these catalog images inspire you to make festive cookies this Independence Day. Our nation's stars and stripes are simply beautiful.